Good Morning! ^__^ Yes, I have decide to join another read-a-thon. I have participated in Bout of Books Read-a-Thon once last year and I really enjoyed it. I was able to get a lot of books read. So I hope this one will be as fun and a good way to read more books on my TBR list. It will last for one week and is created & hosted by Amanda @ On a Book Bender. There is still time to sign up - So I hope I see you there. Within by Clare Marshall (for upcoming blog tour) - Done! 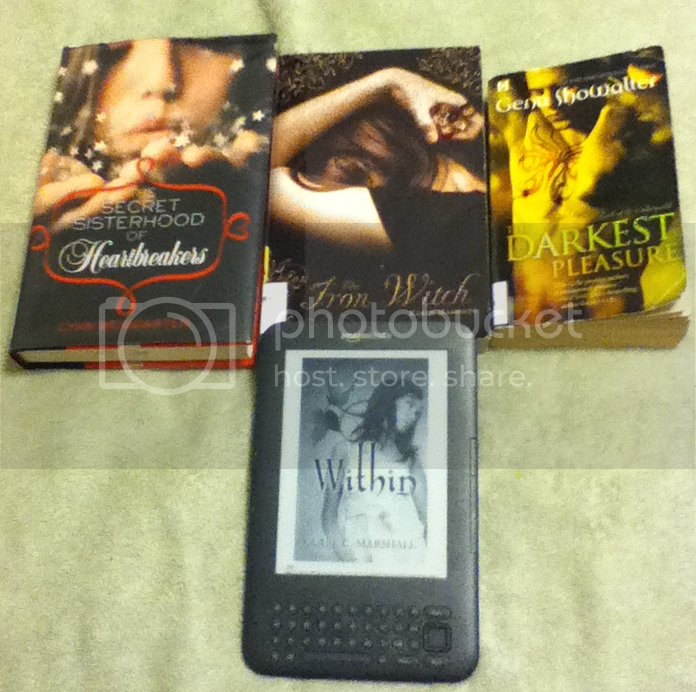 The Darkest Pleasure by Gena Showalter - Done! The Iron Witch by Karen Mahoney - Done! The Secret Sisterhood of Heartbreakers by Lynn Weingarten - Done! Number of books read today: 0 Boo! I was to busy today. Total Time Spent Reading: ? I'm doing Bout of Books too. I did 2.0 and failed miserably--I picked a book that was too long. Here's to a reading week, Good Luck ! What type of muffin is that? And like I said to you on Twitter, I need to read more books in this series! And I'm sorry you missed the Twitter chat!